This morning, I was interviewed by Andrew Peach on his BBC Radio Berkshire breakfast show on the provenance of the word fart. The QI Elves are doing a show in Reading and have published 10 facts about the town, asking for more obscure facts in the run up to their visit. 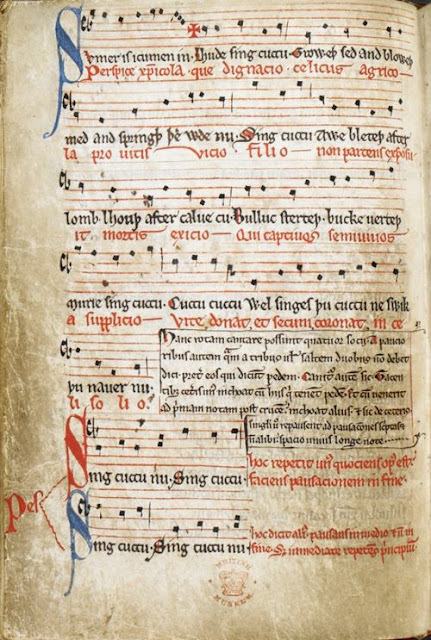 Apparently, the manuscript containing the oldest known song in the English language, Sumer Is Icumen In, was found in Reading Abbey. It contains the word fart. In Middle English, the word is uerteþ - you can see it at the end of the third line. The thing that looks like a p is called "thorn" and is the same as the sound at the end of bath, and the u at the start of the word is actually pronounced more like v. It would have sounded a bit like "ferteth". In the song, the ewe bleats after the lamb, the cow lows (moos) after the calf, the bullock stirs and - depending on the translation - either the stag or the goat farts. Life goes on as normal in springtime in the rural landscape of the 1200s. According to the Oxford Dictionary of English Etymology, the word fart is found in Sanskrit. People have been talking about farting - using a word similar to the modern English one - for a very long time. Etymologically, English probably got the word from the Anglo-Saxons, who started to arrive in Britain in earnest in the 5th century. English is basically a Germanic language with lots of embellishments from other languages for all sorts of historical reasons, and many of our basic words are from German (e.g., house, man, wife, and, land, hand ...). The word fart is considered taboo by many. It is certainly a humorous word and a humorous concept. We have many euphemisms for it, including pass wind, let one off, and the Australian shoot a fairy. Love is the fart of every heart. And others doth offend when 'tis let loose. Do feel free to post your fart poetry and euphemisms below! When I was a child, it was quite a fun thing on a summer's day to visit Margate Lido. My dad had an early morning newspaper stand outside it for several years, and sometimes I'd be with him on a Saturday morning (mum worked part-time at the Green Shield shop) and we'd go to the lido after he finished selling his papers. In the UK, a lido is an outdoor swimming pool with individual changing rooms arranged around and facing on to the pool, often with seating around it, and sometimes with a café or somewhere else to buy a cup of tea and an ice cream. 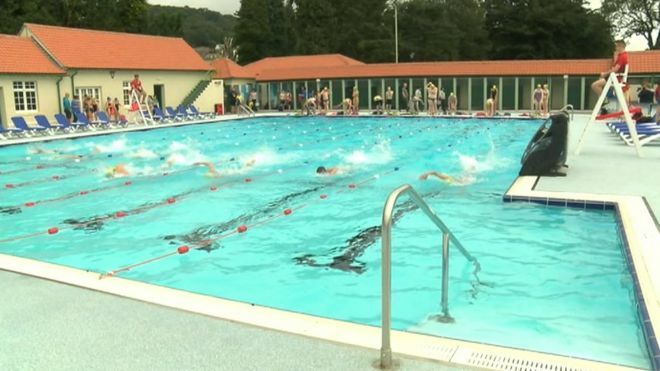 Here's a picture of a lido from the BBC; this is Pontypridd Ynysangharad park lido. While most people visit lidos in the summer, they are also popular with cold-weather swimmers (I haven't ever been one of those - brrrrr!). There has been discussion in Reading recently about the future of the lido at King's Meadow, originally built in 1902, and to be renamed "Thames Lido" when it re-opens. This sparked some interest from the local BBC radio station, BBC Berkshire, about how the word "lido" should be pronounced. Is it "lee-doh" or "lye-doh"? As far as I am concerned, if it's an open-air swimming pool in the UK, it's a "lye-doh". This is how my dad said it and, when people talk about other lidos in the UK, I have never heard them called "lee-dohs" (one of my friends commented on Facebook that she couldn't imagine anyone calling Tooting lido anything other than "lye-doh"). However, a significant number of my friends say "lee-doh", the one in Venice is definitely a "lee-doh" ... and if you're American, it seems, "lee-doh" is the only possibility - check this clip from Legally Blonde (OK, I realise that's a sample of one). For information, the Cambridge English Pronouncing Dictionary - which I co-edit - gives /ˈliːdəʊ/ as the first variant, followed by /ˈlaɪdəʊ/. I'm clearly not following my own pronunciation here. Lido is an Italian word which we have borrowed into English, as with so many other words which help us to express a multi-word concept ("out-door swimming pool", in this case) with one word. English is fine about borrowing in other words as long as there is a gap to fill. Think about all the different types of coffee servings we've borrowed from Italian; it's so much easier to ask for a cappuccino than for a very strong coffee with frothed milk on the top. The Italian pronunciation of lido is more like "lee-doh" and, if you have traveled extensively and/or know Romance languages like French or Italian and do not know of, or do not frequent, open-air swimming pools in the UK, you are unlikely to know and/or use the "lye-doh" variant. A friend also commented that, if you know the band Roxy Music, you may also say "lee-doh", as it appears in the song Do The Strand, in which it is (partially) rhymed with incognito (at 2:45 in the YouTube video below). Not every town has a lido - weather good enough for open-air swimming is not that common in the UK - and the people who originally used lidos tended to be those who could not afford holidays abroad. Such people were more likely 1) not to have come into contact with the word abroad and 2) to pronounce it "lye-doh" based on English spelling rules, i.e., if there is a vowel followed by a single consonant followed by another vowel, the first vowel "says its name", in this case, /aɪ/. But they could also have been calling it a "lye-doh" because their peer group did that. The fact that my dad said "lye-doh" and I have this pronunciation for the UK ones is an indicator of my social background, i.e., we were working class. Click here to listen to me on BBC Berkshire, and skip to about 02:09:00. We move on from the discussion of the pronunciation of lido on BBC Berkshire to cover other contentious words in British English, such as scone, and I mention various accent and dialect maps developed at the University of Cambridge, which are fascinating - and there's now an app which allows you to contribute your variant of several words to the research. How people use language can tell us a lot about how society has changed and developed, and looking at maps where there is a comparison between the 1950s and now is a real eye-opener. 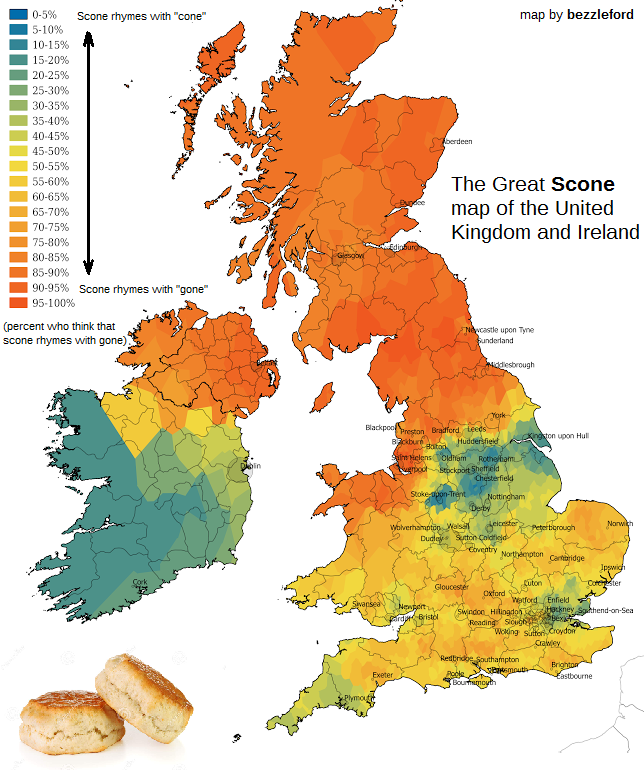 I've nicked the scone map from Reddit as a taster. September 19th every year is International Talk Like A Pirate Day. Started by John Baur and Mark Summers as a bit of a private in-joke in 1995, it took off in 2002 when it was picked up by Miami Herald columnist Dave Barry. But where does that pirate accent come from? The stereotypical one we hear most often in films and on TV shows has similarities to current South-Western accents of mainland Britain, e.g., Devon, Dorset, Somerset and Cornwall. While it is likely that many British pirates originated from that region, others did not (I grew up in Kent, for example, which is also associated with pirates and smugglers). What we associate with the typical pirate accent may well be based on well-known actors’ portrayals of pirates, with Dialect Blog suggesting the speech of the entire genre was based on 1950s screen actor Robert Newton, who was born and raised in Dorset. Interestingly, this is not the direction Johnny Depp decided to go with Captain Jack Sparrow, whose accent – if the trivia is correct – was based on Rolling Stones guitarist Keith Richards (Richards appears as Sparrow’s father in Pirates of the Caribbean: At World’s End). In fact, although Geoffrey Rush does a pretty close approximation to the stereotypical pirate accent, the Pirates of the Caribbean franchise has pirates with accents of English from all over the world, including rather posh ones (e.g., Will Turner and Elizabeth Swan), Jamaican ones (e.g., Tia Dalma), as well as Russian, Turkish, Chinese and Dutch; this was probably nearer the truth. One theory of pidginisation is known as the 'nautical jargon theory', which observes that many Pidgins have nautical words in them (e.g., the word capsize to mean 'turn over' or 'spill') and may have arisen from the development of a common language on board ship during European colonial days; that certainly has piratical connections. But what of the British pirate accent? As the ‘traditional’, swash-buckling period of pirating is generally situated in popular culture somewhere between the 1500s and 1800s, we would expect the British accent during this time to be rather more close to that of the pirates from the 1950s films than Johnny Depp’s mock London. British English was rhotic, which means the sound represented by the letter ‘r’ in spelling would have been pronounced everywhere it was written; this is certainly a feature of the pirate accent. And anyone who listens to David and Ben Crystal’s Shakespeare in Original Pronunciation (from around 2 mins 50 seconds) will hear other vowels and consonants which we associate with the stereotypes of how pirates speak. International Talk Like A Pirate Day is such fun; perhaps we should think about talking like other character types. Talk Like Siri day, anyone ..? English: no longer an official EU language? In the fallout from Brexit, it has been suggested that English could stop being an official language of the EU. Until the 1990s, the most dominant language of the EU (European Union) was French. 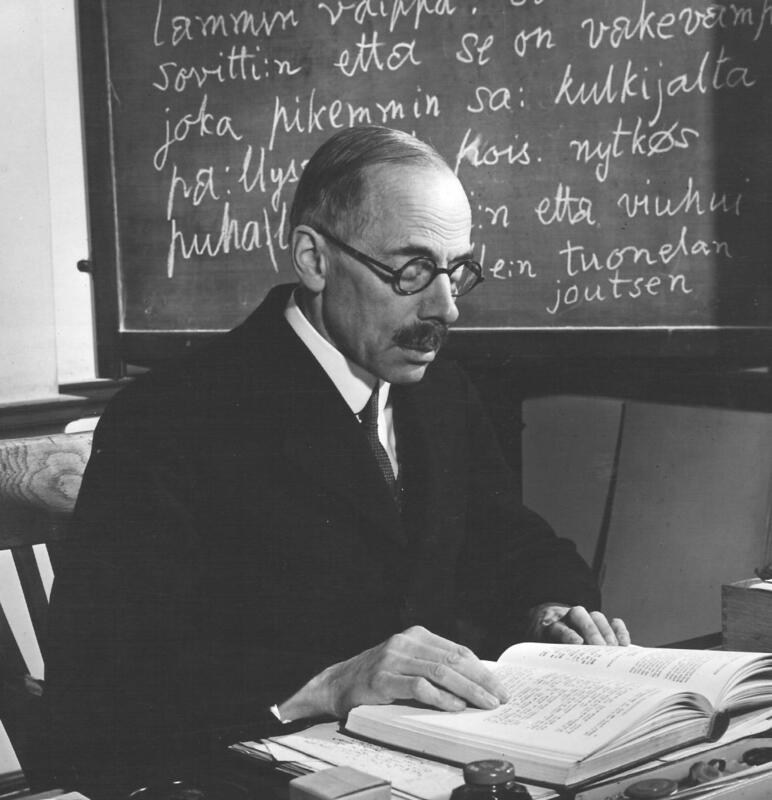 When the EU was the EC (European Community) and the official language policy was defined, Dutch, French, German and Italian were identified as the working languages. However, as more countries joined, many of which had English as a second or additional language, the number of English speakers grew until English was the majority common language. Currently, the EU lists 24 official and working languages. 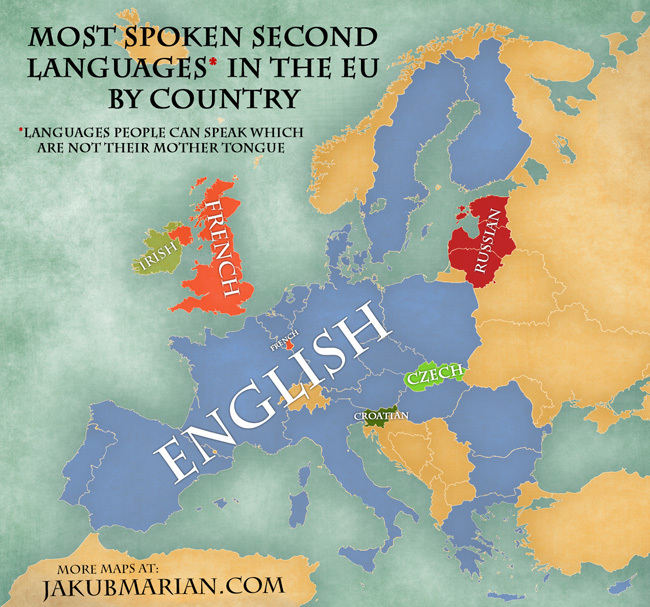 The UK is the only member country which gives English as its official language, but English is the most commonly used language in EU debates and discussions. There are a few member countries which commonly use English but have nominated a different language as their EU official language; for example, the Republic of Ireland gives Irish Gaelic as its official language, and Malta gives Maltese. If Britain withdraws from the EU, there will be no member country listing it as an official language. (There is of course the possibility that England will withdraw and e.g. Scotland and Northern Ireland will remain; it will be interesting to see what happens linguistically in that instance.) In order for English to continue to be used as an official language, all remaining members of the EU will have to agree*. But does choice of language work like that? In fact, in some post-colonial situations, English is regarded as a more or less neutral language. In India, for example - and this is an oversimplified summary - English was to be phased out over a period of 50 years post-independence in 1947 in favour of Hindi. However, as not everyone in India speaks Hindi, and many do not want to for various cultural reasons, English continued to be used, and is now an official language of India. In Hong Kong, there was quite a strong desire at the time of the Handover in 1997 for the British to stay and for the territory not to be handed back to China. The fact that English is still an official language of Hong Kong may reflect this desire, but also it has its uses in Hong Kong, which is an international hub for trade and finance. Singapore has Malay, Chinese (various dialects) and Tamil speakers, among others; English is a unifying language. But these Englishes we are talking about here are not 'British English', or even 'American English'. The Englishes spoken around the world may be based on one or other variety, but they have developed their own vocabulary and grammar. Euro-English is no exception; there is research into this variety, and even guides on how to use EU English. English simply does not belong to traditional 'native' English speakers any more; it belongs to everyone who speaks it, and communities will enact development to fit need and use. Brits and Americans need to bear this in mind when using English to interact in international settings, as they cannot assume they will be understood by every English speaker. So, will English cease to be a language of the EU? Probably not, either in conversations between EU member countries, MEPs, or in EU interaction with other countries around the world**. It is simplistic to think it can simply be voted out. After all, English is much more than just the language of the United Kingdom. * I had understood that there would have to be a vote to keep English as a language of the EU. The opposite is, in fact, true: there would have to be a unanimous vote to remove it as an official language, as clarified in this statement on behalf of the European Commission in Ireland, dated 28th June 2016. ** One MEP from Sweden suggests that communications in the EU could be fairer in English, as it will be everyone's second language. "I would have complimented you on your looks, your accent and your hair - in that order. :-)"
While this is lovely (thank you, Indian FB friend! ), I felt a bit uncomfortable about it, particularly the looks part. This got me thinking about what it's actually acceptable to compliment someone on in my culture. I would not feel comfortable complimenting someone I didn't know well on their physical looks - certainly not an adult. If I was complimenting a child, it would probably actually be directed at their parent(s) - along the lines of "didn't you do well producing such an adorable mini-you?" I don't think it's unacceptable to do that in my culture, but would be interested to know if anyone disagreed. Why wouldn't I compliment someone on their looks unless I knew them well? I'm not sure. Is it because it's not really a person's choice how their physical features happen to be arranged? Is it objectifying someone too much? I've been trying to think if anyone I didn't know well had complimented me directly on my looks other than my Indian FB friend. Aside from the very odd wolf-whistle whilst passing building sites in my youth, I really couldn't think of any time this had happened. So, clearly, complimenting someone on their looks if you don't know them really well is just not done in my culture. Apologies, Indian FB friend, but it feels a bit like being turned into a commodity rather than being valued as a person. In my professional context, I have been complimented on my accent quite a lot, and this is the context in which I place my Indian FB friend. I've always found it a bit odd - but not entirely, because my area is English pronunciation / phonetics (I edit a pronouncing dictionary) and people invite me to conferences to speak about that. Some - one assumes - must think I have an RP accent (I haven't). Although I doubt anyone from UK academia would compliment me on it, occasionally overseas conference organisers and delegates approach me to say how lovely my accent is. I'm pleased they think so; I worked very hard to speak clearly, and am reminded of my dad picking me up on my accent and grammar when I was a child. A compliment on my accent horrifies me much less than the idea that someone might approach me and express an opinion about my looks. I do have experience of other phoneticians commenting on features of my accent in a more objective way. One mentioned my diphthongal FLEECE vowel, for example, and Prof John Wells noted in a presentation we once gave that I have more glottal stops than he does. Although I grew up in Kent, I lived in Yorkshire for eight years; occasionally bits of that seep in and people have mentioned it. Clearly, accents are very important in forming impressions, as various matched-guise experiments have shown, and still a matter of great interest, as recent dating website surveys indicate. Excellent communication skills are often listed as an employment criterion and accent probably plays a part in some employers' selections, whether it should or not (I'm not going to get into the argument about non-native speaker English teachers here). But, aside from the odd bit of banter you get about the FOOT/STRUT split or BATH merger between northern and southern English speakers in England, it is only when someone is actively criticised for their accent that it really gets noticed in the UK as an issue. For example, in an Ofsted report some time ago a teacher in West Berkshire was given as a performance objective trying to sound "less northern". I find that objectionable, personally, and so did the Independent (and various other newspapers). Outrageously, the superb Steph McGovern from the BBC Breakfast news, who is from the north east of England, was sent money by a viewer for elocution lessons. But why do I feel is it unacceptable to comment on someone's accent, when clearly others do not? One can change one's accent with much less physical intervention / surgery than changing one's looks. Why should that be necessary if one is clearly spoken with a regional accent? After all, everyone has one accent or other. Have you had people compliment you on your accent, if you are a native speaker of a language? I'd be interested to know. I am entirely comfortable about being complimented on my hair. Or my shoes. Or my jewellery. Or my clothes. Or my choice of phone or tablet or other consumer item. Or my handwriting. Etc..
Is this because it is a conscious fashion/style choice, as opposed to something I can't change so readily? That may be the case. It's true that I have the white streak in my hair by an accident of nature, but I choose not to colour it, so it is a statement about me that I am choosing to make public. Perhaps that could be said about my accent, too. But - surgery and very clever contouring aside (and I don't do that - not enough hours in the day!) - I can't change my looks, and I don't want to be judged by them.